The support for the Taranaki Air Ambulance Trust has been strong this week! And what a week is has been for our tireless trustees! They have been hosted and have hosted. 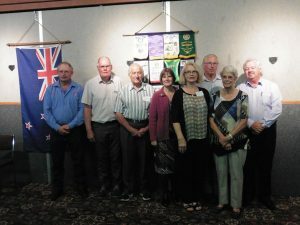 The Eltham Lions Club visited us last Tuesday night, followed this week by the Codgers Coffee Club. And the trustees were hosted last night by the Waitara Rotary Club. Thank you to all for your generosity too, every little bit does back into this vital community service. Do you have a community group that may like to see and hear more about what we do for our region? If so, get in touch, we would love to hear from you. 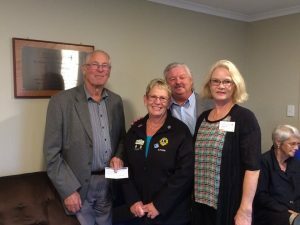 TAAT Trustees Bruce, and Christina & TAAT PR advisor Gordon Brown being presented with a donation from the Eltham Lions Club by Joyce Lawrence.